Madras White Buffalos lost to Molalla 4-1, Gladstone Gladiators 4-1 after good start. The White Buffalos girls soccer program lost an away game to Molalla 4-1 Sept. 27. The girls were without several players due to injuries. Madras held the Indians scoreless, until the 31st minute of the first half. "The girls battled hard," head coach Shawn Darrow said. "We had a ton of great opportunities to score, but were unable to capitalize on any of them. They definitely outplayed us, but I really feel like the gap between us and them is smaller this year, especially when we are at full strength." The Buffs ended the game without four of their starters and are looking to be healthy by next week. 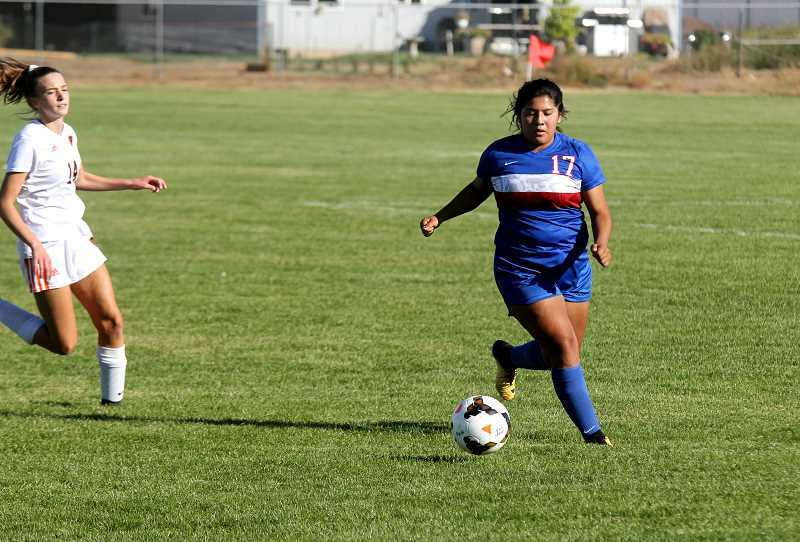 Madras girls soccer could not get by the Gladstone Gladiators in a 4-1 loss Sept. 25. The White Buffalos and the Gladiators battled in the first half for a 1-0 score in favor of Gladstone. The ball bounced off a Madras defender right in front of Brianna Lewis, of Gladstone. Lewis controlled the ball, took a couple dribbles and made a close shot in the left corner of the goal. The Buffs had a great opportunity of their own when Erika Olivera made a perfect lead pass to an open Jackie Zamora. Zamora received the pass and took an open shot, but it sailed a little too high. The Buffs were down 1-0 at the midway break. Both teams were controlling the ball well and Madras went on a pressure-heavy attack at the end of the half. In the second half, Lewis took a hard shot that Madras goalie Cheydon Herkshan blocked, but the ball went right to Kasey Hogan, of Gladstone, who tapped the ball in for an easy goal. A few minutes later, Gladstone forward Gwyneth Roberson dribbled the ball down the right sideline and found Hogan in the middle of the field. Hogan kicked the ball in and gave the Gladiators a 3-0 lead. They would score another goal before the end of the game. Madras scored one goal late in the game, thanks to junior Kelsey Olivera. She was playing left wing and one-timed the ball in the air. The ball soared in the upper right corner. "We played a tough, good, well-coached team," Darrow said. "They were faster than we were and we didn't adjust to their speed very well and part of that was the girls just not being in the right places and executing. Some of that falls on me; teach a little better." "We lost our marks in the back," he said. "These are things we can work on and address, get better for sure, especially in our back line. It is tough right now, we have girls that have never played back before, never played defense before. We are missing two senior defenders, but that is what happens sometimes. We will coach our players up and get ready when we face them again." With the two losses, the team moved to 4-3-1 overall and 1-2-1 in league play. The girls played Estacada at home Tuesday, Oct. 2, after the Pioneer's deadline.